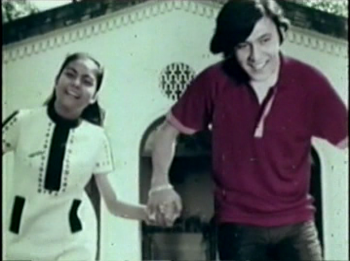 Nora Aunor and Tirso Cruz III star in the 1971 film, Guy and Pip. On my first visit to the ABS-CBN Film Archives in 2005, I was told that their holdings represented roughly 2,400 of the mere 3,000 titles that survive from the inception of Philippine cinema (some 8,000 films are estimated to have been produced locally since the cinematographic apparatus was introduced in 1897).4 Maintained for broadcast content, the ABS-CBN Film Archive is not a public research collection; special permissions are required for visiting scholars. The archive’s temperature-controlled vaults, designed to preserve access copies on broadcast-quality video for the medium term and film prints and master negatives for long term storage, represent the best archival conservation measures in the Philippines. Temperature controls are able to arrest, but cannot reverse, the degeneration of films previously subjected to improper storage in a tropical climate. Such limitations notwithstanding, the ABS-CBN film archive is presently the most significant bulwark against the encroaching loss of the majority of Philippine cinema. The fragility of the Filipino audiovisual archive–much of it on video–is primarily a problem of media obsolescence.5 In the 1980s, deteriorating studio era classics were transferred to Betamax by Mike de Leon, a major director of the Philippine New Cinema and grandson of the LVN studio founder, Doña Narcisa “Sisang” de Leon.6 In some cases, these flickering Betamax tapes are now the last extant copies of lost LVN films, themselves objects of restoration on digital video. Pepot Artista recreates the movie-mad culture of the early 1970s, a milieu dominated by the superstardom of Nora Aunor (affectionately referred to as “Guy” by her fans) and Tirso Cruz III (nicknamed “Pip” by his devotees), who were romantically linked both on- and off-screen. 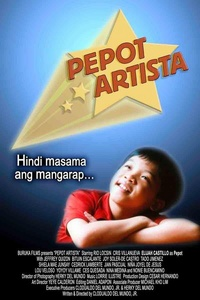 The child protagonist Pepot (Elijah Castillo) is the impoverished moviegoer-as-dreamer: a little boy who sells komiks (comic book-sized movie magazines) on the street, Pepot dreams of emulating his screen idols: the action star Fernando Poe, Jr. (“FPJ”) and teen icons Guy and Pip. 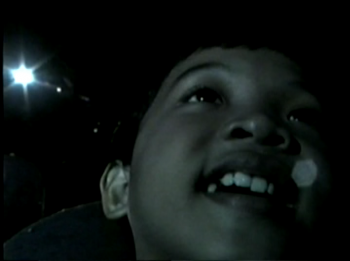 The star-struck Pepot looks up at the screen, the beam of a film projector behind him. Excerpts from older films like Biyaya ng Lupa (Blessings of the Land, 1959) are interspersed throughout Pepot Artista. 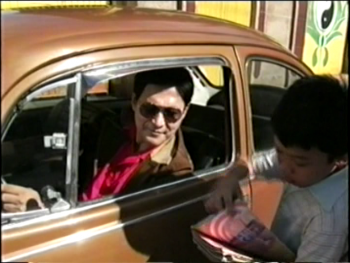 The joke of an early scene is that an unnamed motorist who buys a magazine about Guy and Pip is the actor Tirso Cruz III himself. The joke plays on deliberate anachronisms: the actor as he looks in 2005 makes an appearance in the diegetic world of the seventies, and archival footage of Guy and Pip as youthful matinee idols are juxtaposed alongside the visage of the older actor in the present day. Pepot’s buddy fails to recognize Pip, but Pepot and the offscreen spectator do. Pepot’s cross-generational, anachronistic gaze of recognition at Pip functions as an inside joke, both a cinephilic homage to pop icons and a self-reflexive jab at the film’s nostalgic recreation of the seventies. 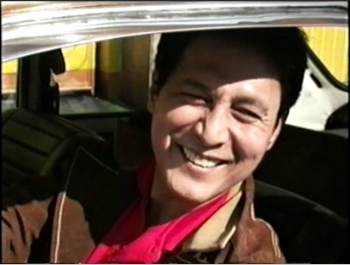 An anachronistic inside joke in Pepot Artista: the actor Tirso Cruz III in 2005 plays himself in the seventies; Pepot recognizes him. The interspersed footage from Guy and Pip (1971) features Maria Leonora Teresa, a three-foot-tall ceramic doll to whom the teen stars croon a hit ballad. Guy and Pip’s famous white “love child” is parodied in a later scene. Pepot fantasizes that he has been adopted by Guy and Pip impersonators; he joins their act, playing the transvestite part of their doll-daughter. …is parodied by Pepot in drag. Pepot’s gendered and racialized impersonation of the inanimate blonde doll is also a form of temporal drag.15 Retrospectively inscribed onto the cross-dressing body of the young boy’s fandom is the foreknowledge that Nora Aunor’s gay male following would grow steadily in the years to come. In a kind of temporal condensation, the nostalgia of our own decade and a foreshadowing of 1980s films thematizing fandom are rear-projected onto Pepot, a queer child of the early seventies. 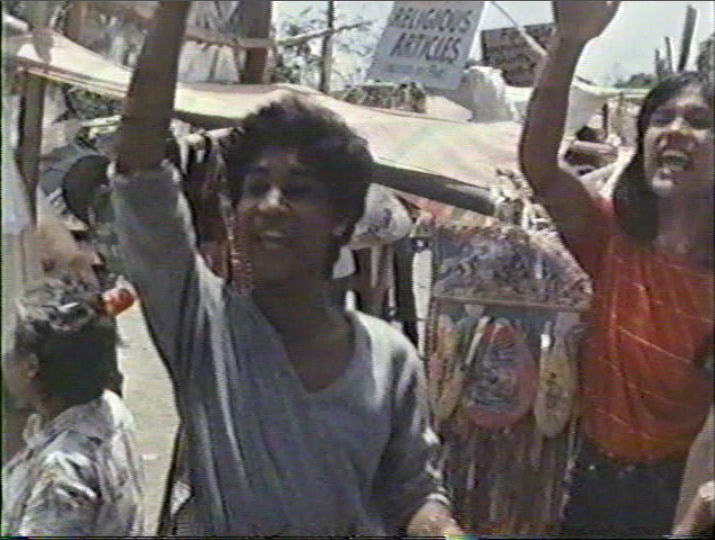 In Ishmael Bernal’s Himala (Miracle, 1982) shots of campy gay male fans are metonymic of Nora Aunor’s devoted fandom. 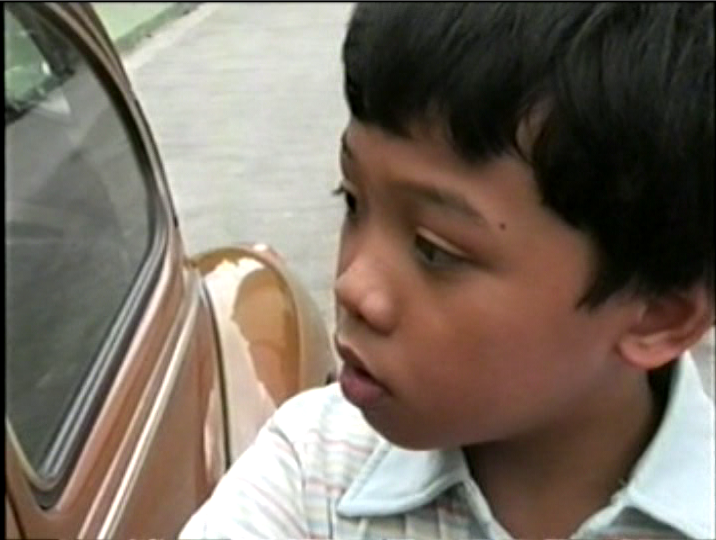 In the context of Philippine cinema’s fragile and fast-declining film and media archive, Pepot Artista’s inside jokes and archival footage fold the old into the new, enacting the survival of nearly-forgotten popular pleasures. Pepot’s wellspring is the affective archive of a filmmaker-preservationist, a fandom steeped in history. My thanks to Vicky Belarmino and Mary del Pilar, both members of SOFIA, the Society of Filipino Archivists for Film. See http://dev.martinisantos.com/sofia/. 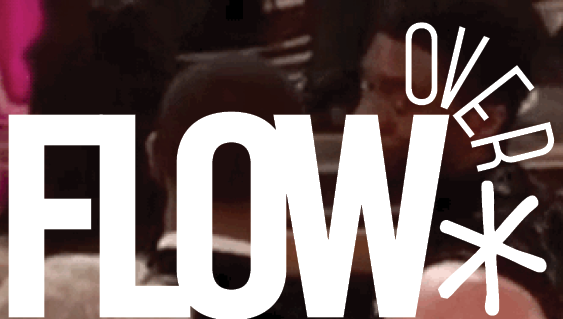 Beautifully written – thanks for this. I have not seen the film but, in reading your article, it also reminds me of Davide Ferrario’s DOPO MEZZANOTTE (2004) – the similar cinephilic impulse in homage and recognition, the simultaneous pressures of rapid media obsolescence and nostalgia for the “old” technologies. I will be sure to watch this film! I always enjoy learning from your scholarly but accessible pieces. They always verge on a call to action of some kind, but the economics and lack of resources always seem to get in the way… I am looking forward to the next 2 articles. Miss you lots. Really loved the article Bliss! Knowing very little about subject matter, I’m very interested in seeing how the Phillipine cinema continues to grapple with preservation and access. I appreciated your highlighting the non-institutional ways a culture can preserve media, like in Pepot, and why such creative methods may help keep these films alive (even if they fade both literally and metaphorically from us). Seeking out alternative modes of preservation are not only essential, but as you pointed out, create something new, preserve the past, and stands a wonderful point of reference between these two spheres for scholars. This idea of the archive and reference (intertextual or otherwise) allows me to ponder how these nods can both be referential on a comedic level and yet deeper on a cultural, nationalistic recognition of their stories and art. Thank you so much for these incredibly insightful and encouraging comments! These ideas are all pretty new “thought-experiments” for my next book project on Philippine cinema, Troubled Archive. I will definitely check out Dopo Mezzanote. And yes, I guess I am trying to both make a call to action and hold myself accountable to it as well, as best I can, by writing about films that might one day be accessed only through secondary sources. So the idea of creative, non-institutional, and perhaps primarily affective ways of ensuring these films’ “survival” goes to the very heart of what I’m trying to explore. Many many thanks for engaging with this piece!